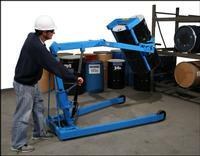 The Omni-Lift can pick up a drum off the floor regardless of its horizontal or vertical position and place it on any surface up to 72" high. 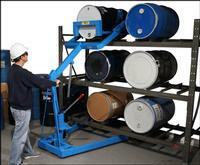 Handles fully loaded drums up to 800 lbs. or half full drums up to 500 lbs. Easy loading cinch type saddle handles 55 gallon steel drums (optional adaptor MO-3313-P available for 55 gallon tight-head plastic drums). 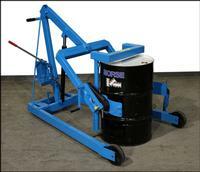 Omni-lift can also be used for controlled pouring and dumping. All welded steel frame rolls easily on 8" polyolefin wheels and two 4" casters. 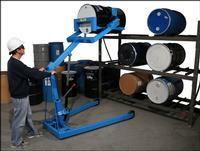 Designed for use with pallet racks that have adjustable drum cradles. Minimum 8" clearance between drums and 12.5" on right side of far right drum on rack. Minimum 8.5" clearance for legs. Power units available. Full lift on manual unit is obtained in about 45 strokes. 30:1 reduction gear box to rotate drum 360 degree and hold in any angle.